I cannot find the answer to this anywhere. The problem is that the top of the treadmill by the front roller is the part that keeps tracking all the way to the left when I get on it. At one point the belt started grinding all the way to the left. The belt is almost a little diagonal from the front roller to the back roller. So if I adjust it so the front doesn't grind to the left t then it comes dangerously close to the back grinding on the right. Then on top of that, if I do done a happy medium, the belt moves to the left when weight is applied. Is there even a way to adjust the front roller on this model? Okay, so I thought I had it fixed, but when I straightened the walking belt like advised, I turned it on and the belt immediately goes a little diagonal. It quickly tracked over to the left when my weight was applied. So I adjusted the left hole in the back a quarter turn clockwise in increments until I thought it was fixed. When I apply weight and start walking the belt moves a little to the left but then it stops moving over and stays where it's at while I'm walking. I think it's okay so I start running. I can only run for about 5 minutes before it's tracked over to the left too far. I want to adjust it more, but I don't want to break anything. I have a few suggestions brie I continue. Is it okay to run with the belt not completely lined up as long as it's not grinding? 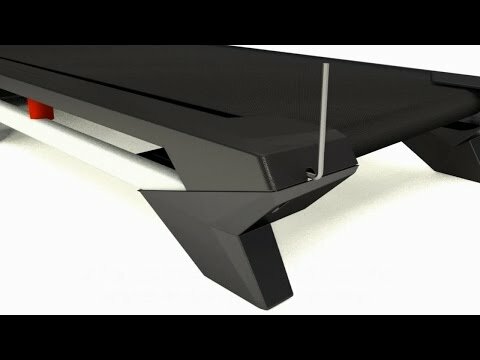 How tight should my belt on this model be? Maybe I'm doing something wrong I don't know about.